Justin Kobylka (J. Kobylka Reptiles) is a professional reptile breeder who has kept and bred reptiles for over 17 years, including bred dozens of exotic species and non-venomous North American kingsnakes. He has BS degree in Mass Communications from Southern Adventist University and have media training from classes and media interview experience from my experience in several professional capacities including print / television / radio and podcasts. J. Kobylka Reptiles supports the political lobbying arm of the reptile industry, including the organizations USARK, PIJAC and US Herp Alliance. On the Web - Justin Kobylka is on Snakes and the Fat Man to tell some stories, behind the scenes info and personal details about J. Kobylka Reptiles. 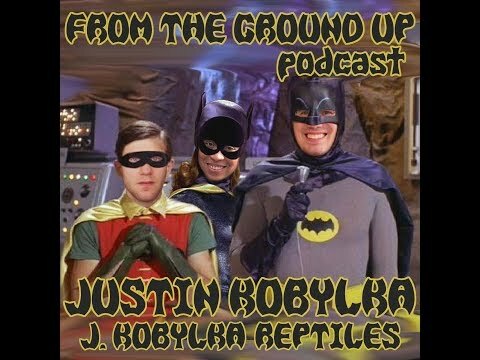 The Reptile Report - This week’s featured is Justin Kobylka from J.Kobylka Reptiles. We are talking JKR Gear, JKR’s world’s first Firefly Clown, Super Pastel Yellowbelly Pieds, Leopard Pieds and much more.